Proper nutrition is important when caring for any dog, but it's especially crucial for very small breeds like the Yorkshire Terrier. Truth be told, they're a difficult breed to feed. But, this homemade dog food for Yorkies recipe will provide your terrier with the nutrition his small body requires. As I explain briefly in my video guide, you really need to consult an expert before switching your Yorkie to a homemade diet of any kind. These are among the smallest dogs in the world, which means it's extremely important to know their exact nutritional needs. There are a lot of factors that impact the number of calories that your pup should be consuming each day. Age, activity level, and health conditions all play a part in determining the nutritional needs of a dog. Size is also a large variable. Your dog may have unique needs as well. Diet is important in controlling many health conditions including obesity, diabetes, thyroid problems and kidney disease. Your veterinarian will help you decide on the best homemade dog food for Yorkies recipe, and this one may work for your canine companion. Feeding requirements for this recipe are 1 cup per 7 pounds of weight. That's equal to 1/2 a cup per 3.5 pounds of weight. First, you'll need to pulverize the veggies in a food processor or chop them by hand. As you can see, I chose to use sweet potato, broccoli and kale. You can use any dog-friendly vegetables you have on hand. Possible substitutions include pumpkin, green beans, carrots or peas. In a large pot, mix all of the ingredients together. Cover them with water and then bring them to a slow boil on low heat. 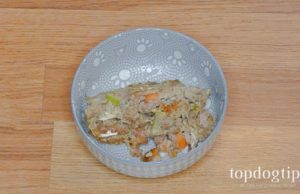 Stir this homemade dog food for Yorkies recipe frequently to prevent it from sticking to the bottom of the pot. You'll need to cook it on low heat for about 45 minutes, or until the turkey and chicken liver are fully cooked. Once the meal is fully cooked, you can feed it to your Yorkie as soon as it is cool. Store the leftovers in an airtight container in your refrigerator for 5-7 days. 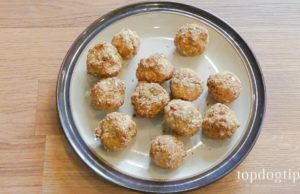 If you prefer, you can freeze this homemade dog food for Yorkies recipes after cooking it. Store it in the freezer in an airtight container for up to 3 months! By freezing it, you can prepare plenty of food in advance. This allows you to stick with a homemade dog food diet without having to find the time to cook for your pet every few days.